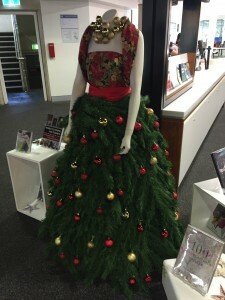 QUT library is joining in the celebration of our newest QUT graduates this month with a lovely display on level 5 of Kelvin Grove library. 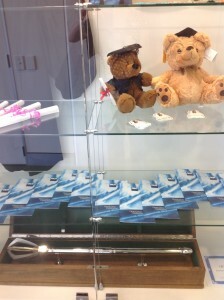 The display features graduation booklets, a gown, and little souvenir teddy bears. If you are curious to know more about academic dress requirements check out this FAQ from the Student Guild (the tassel on your motarboard should fall to the right after graduating). 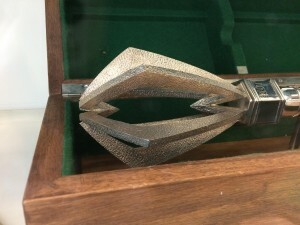 The most impressive item on display, however, is the Registrar’s mace. It is a symbol of the authority of the institution and is generally carried at the beginning of the academic procession. 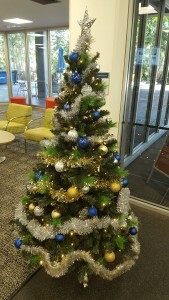 If you look closely you can see QUT stamped on it. Remember, as a recent graduate you are entitled to one year’s free alumni membership to the library, just make sure you register online so we can send a card out to you. 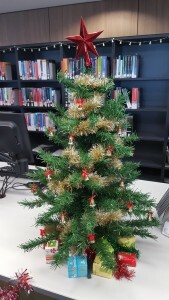 QUT library would like to congratulate all those who have reached the end of their studies, we wish you all the best for a great ceremony and graduation day.